53, 221 sq. ft. vacant land package investment opportunity. REGIONAL DISTRIBUTION CENTER DISTRICT in the Golden Triangle , City of Perris, Ca. South of the March Air Reserve Base. Land package consists of four contingent parcels. Frontage is newly paved and previously widened with sidewalks, curbs and lighting with a new signal at the corner of Webster and Nance Streets. Perfect for the owner/builder or investor. 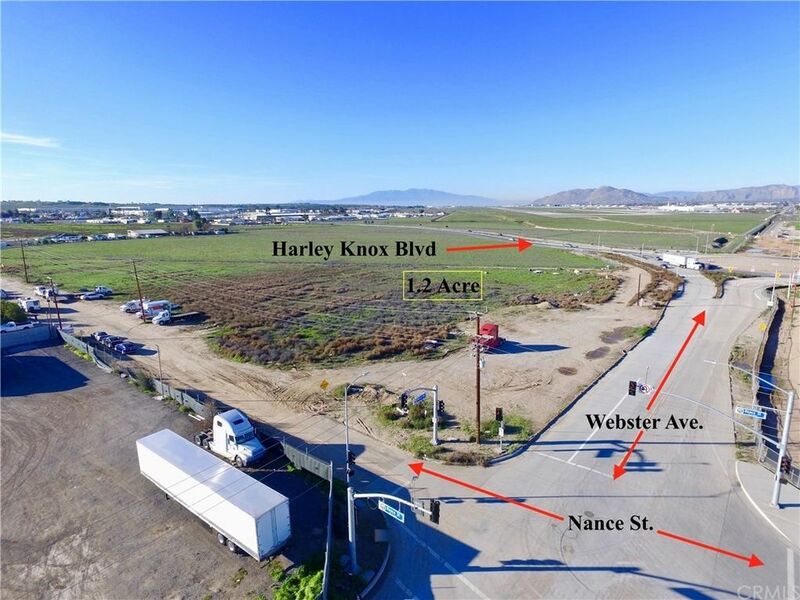 As per the City of Perris, these properties are located in the General Industrial Zone and the Perris Valley Commerce Center Specific Plan (PVCC SP). Manufacturing plants, storage facilities, distribution centers, warehouses, etc. Zoning approved for commercial growing and warehousing centers. Parcels are between the I-215 Fwy. North Perris Blvd., and the Ramona Expressway which insures easy access for shipping and commuting. Re-aligned Harley Knox Street is on the Northeast corner of lots. Warehouses currently being constructed within close proximity. The construction is underway directly across the Street. Close proximity to many existing warehouses, including Lowe's Distributing Center, Ross Distributing Center, WalGreens Distributing Center, Amazon Fulfillment Distribution Center, Home Depot Perris Distribution Center and more! North Perris Development Projects include several 1 million+ sq. ft. industrial Warehouses. Incredible location. Must see! Directions: From I215 take the Harley Knox exit east to Webster Ave, property is on the right. We're sorry we have no data related to schools for this listing.